(NaturalNews) The U.S. Department of Agriculture is joining the militarization trend that's spreading like wildfire across federal agencies. Both the EPA and IRS currently have armed federal agents, and recent events involving the BLM in Nevada showed that even the Bureau of Land Management possesses a small army of long-range snipers and heavily armed paramilitary operators. So we next reached out to Jeremy Alcede, founder and CEO of Tactical Firearms, a Katy, Texas firearms retailer and large indoor training facility that hosts training sessions for both private civilians and local law enforcement. "That class of weapon is used for night-time battle," Alcede told Natural News. "Honestly I think the federal government is using different agencies to stockpile these weapons," Alcede continued. "I can't imagine why the USDA would need submachine guns to enforce agricultural regulations. Are they planning for a mad cow disease rampage of some kind? But then again, why does DHS need hundreds of millions of rounds of ammo? They've stockpiled enough ammo right now to have one bullet for every American." It's true, believe it or not. Although the discovery of the massive, multi-billion-round ammo purchases by the federal government were initially derided as "paranoid conspiracy theories" by the lie-slinging mainstream media, it turns out these purchases are completely true and irrefutably documented. The federal government really is stockpiling over a billion rounds of ammunition for some yet-unknown purpose. 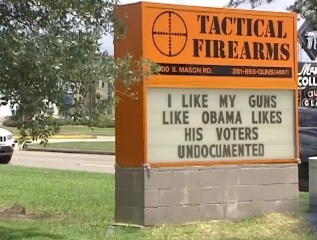 Tactical Firearms recently unleashed a wave of controversy across the 'net after sporting a store sign message that reads, "I like my guns like Obama likes his voters - undocumented." This sign has been widely shared across the 'net by a growing number of Americans who are increasingly frustrated by the Obama Administration's policies on a wide range of topics, including debt spending, gun control and immigration. Even many former supporters of Obama are now extremely worried to learn that Obama's government is clearly in favor of a massive build-up of guns as long as they are in the hands of federal agencies. Case in point: The recent Bundy ranch standoff in Bunkerville, Nevada, where BLM agents brought hundreds of militarized agents, snipers and government helicopters to a standoff which they claimed was about "saving the desert tortoise." This is all being done under the excuse of "public safety," but as I reveal in my article The great government hoax of public safety, that's just a flimsy cover story. This shift even has progressives concerned so much that gun control advocates are seriously starting to wonder why there are so many automatic weapons in the hands of the feds. In a story entitled How Every Part of American Life Became a Police Matter, the progressive-minded Mother Jones magazine says, "American society is starting to resemble a police state." There is the proliferation of heavily armed SWAT teams, even in small towns; the use of shock-and-awe tactics to bust small-time bookies; the no-knock raids to recover trace amounts of drugs that often result in the killing of family dogs, if not family members; and in communities where drug treatment programs once were key, the waging of a drug version of counterinsurgency war. (All of this is ably reported on journalist Radley Balko's blog and in his book, The Rise of the Warrior Cop.) But American over-policing involves far more than the widely reported up-armoring of your local precinct. It's also the way police power has entered the DNA of social policy, turning just about every sphere of American life into a police matter. The USDA now looks to join this radicalized militarization push by the federal government, arming its agents with submachine guns -- class 3 weapons which private citizens cannot legally purchase without enduring extensive background checks and paperwork with the ATF. The tritium sights clearly indicate the USDA anticipates "night time raids" with these submachine guns, and there's no question those raids will be conducted on U.S. soil. 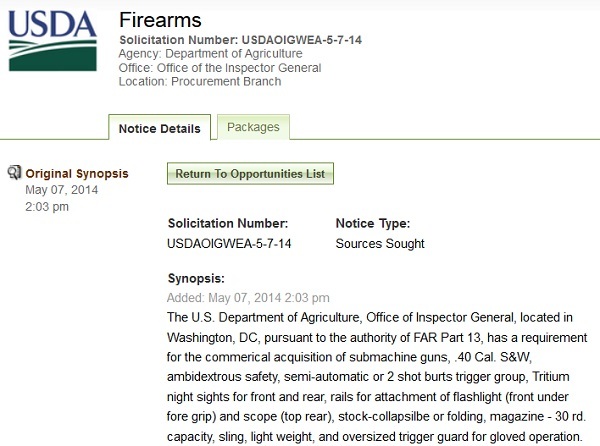 The only question remaining is: Who does the USDA imagine it will be raiding at gunpoint with these automatic weapons? The answer, sooner or later, is YOU. That's how the rise of tyranny works in an emerging police state. First the weapons are for "terrorists." Then they're for "criminals." And before long, anyone who questions the government's rapid militarization is labeled an "anti-government criminal" and added to the raid list. I happen to run a certified organic food manufacturing facility subject to USDA regulation. Now I have to legitimately wonder whether I'm supposed to expect a night-time armed raid on my facility by overzealous USDA operatives eager to play with their new submachine toys. They wouldn't find much, of course, other than pallets of raw materials, a microbiology testing lab and food packaging equipment. But since when did the feds ever need an actual, legitimate reason to conduct armed raids in the first place? I know a man in California named James Stewart who was raided at gunpoint and thrown in jail for the "crime" of distributing fresh milk from local farms. He's still facing felony counts in Ventura for ludicrous charges related to this "crime." When the feds want to shut you down, they can always trump up dozens of charges and have you arrested. But now, thanks to this rapid militarization effort, they can also stage armed, SWAT-style raids of our homes, businesses and farms. 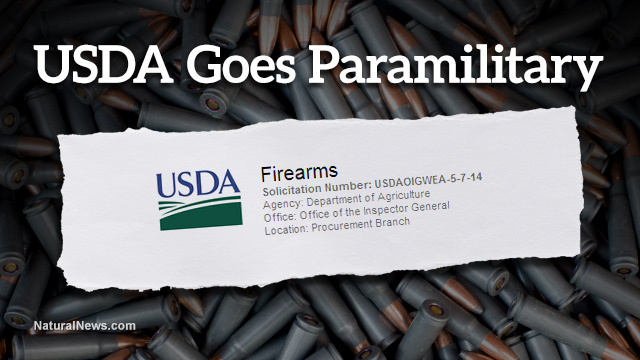 When the USDA has automatic weapons, night sights and 30-round magazines as part of a department of "agriculture," something has gone terribly wrong in America. That's why I say, "Restore the Constitution!" Government was limited by the Constitution for precisely this reason: If you allow government to concentrate power, it will eventually use that power to subjugate the People. It is no longer a conspiracy theory to make the informed observation that America is more and more beginning to resemble a fascist police state, complete with the world's most massive prison system and the arming up of federal agencies that have no business with automatic weapons in the first place.